FinTech’s not disrupting financial services. Consumers are. 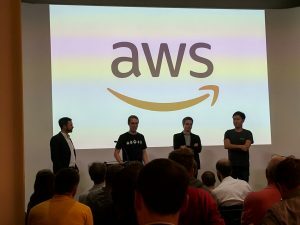 Sam Everington from Starling Bank speaks at the AWS Startups Loft in London. As consumers become increasingly comfortable purchasing online, mobile access to their banking needs is following suit. The concept of “banking on the go” was the topic du jour last week at a FinTech panel discussion hosted by AWS’s London Pop-up Loft. Entitled “Open Banking: Innovation for Customers,” the session brought together representatives from emerging startups Starling Bank, Tail, and Transferwise, who all shared how they are taking advantage of cloud computing to improve customer experiences. Sam Everington of Starling Bank began the discussion by explaining how their platform is entirely mobile. This gives their customers the ability to instantly check their spending habits, apply overdraft controls directly from their app, and eliminate all fees when traveling abroad. Everington also noted that Starling’s API is public and open to all third-party developers, ensuring a variety of new services to constantly be added to their platform. Critically, all of Starling’s customers own their data and ultimately control who they want to share it with, ensuring privacy at all times. One company that has taken advantage of Starling Bank’s public APIs is Tail, a cash-back app. During the session, Philipp Keller explained that open APIs are the best way of eliminating friction in “classic” offer marketing. Using their own company as an example, Keller said that the entire app was launched on Starling in three months—including technical integration and compliance reviews. Currently available in London, Tail sends customized real-time cashback offers to customers, with cashback being sent straight to their account on a weekly basis. Talking banks on the go at the AWS Pop-Up Loft in London. Starling’s and Tail’s innovations have led to success for companies like TransferWise. 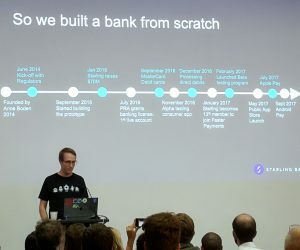 Tony Qin, TransferWise’s Full Stack Engineer, thanked the efforts of those before him and detailed the scope of their startup’s borderless accounts—including their customers’ ability to get bank details instantly in over 27 local currencies. He also noted that TransferWise allows customers who travel a lot the ability to eliminate costly transaction fees. This feature has been very popular, said Qin, sharing that there are currently one billion pounds being sent monthly through their platform. By evening’s end, everyone had reached a similar consensus: With the current pace of innovation and the growth of new technologies like Blockchain, it’s difficult to guess where the FinTech industry will be in the next year. 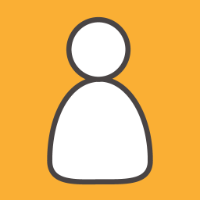 If you’re interested in learning more about the cloud technology that powers Starling Bank, Tail, and TransferWise, please visit the AWS Loft website to find a Loft near you.